You might currently be looking to replace an aged and dented door that's no longer functioning properly, or simply looking to change things up a bit and improve the curb appeal of your home. Whatever the case may be, there are usually three different materials that your new door can be made of, each with its own distinct advantages and disadvantages. Our experts wrote a short summary of the attributes of each material, but if you're looking for more information, please don't hesitate to reach out to us. One of the most attractive aspects of wood is its natural warm aesthetic appeal. If you like the idea of panel surface with a subtle pattern, you might find charm in a varnished finish that allows the natural markings in the wood to come out. This material is also a natural insulator, so it won't have to be fitted with extra sheets in order to protect your garage from outside temperatures. The problem with a natural material like wood is that it generally absorbs moisture and reacts to changes in weather. A wooden garage door will expand during winter and contract in the summer. If it isn't routinely applied with a protective layer of paint, it will gradually begin to rot and warp. 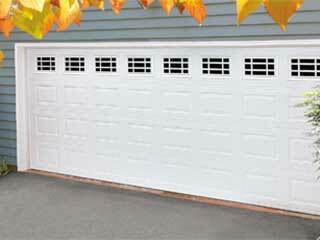 Of the three types, metal garage doors are generally the most robust and durable. They won't decay or break as easily as wood or aluminum and will be able to withstand much more powerful impacts. However, a steel garage door is generally less detailed and beautiful than its wooden counterparts. Their aesthetic is colder and commonly minimalistic. There are all sorts of faux-wood finishes that your steel door could boast, but to many people, the solid vault-like appearance steel offers will be a positive characteristic. One of the biggest downsides of steel is that it can rust, and must be applied with a coat of protective material. It is also quite heavy and will require a more powerful opener than aluminum. This material is often chosen for its low maintenance requirements. Aluminum doesn't rust or rot, so you won't have to spend a lot of time taking care of it, unlike wood and steel. It also tends to be quite cheaper than these two. However, the main downside of an aluminum garage door is that it will dent rather easily, and won't be naturally insulating either. That means that in order to gain these qualities it will need to be bolstered with additional sheets and panels, which may end up costing more than what simply getting a door from a different material would. The choice ultimately comes down to your specific needs, as well as your budget. Contact our team at Garage Door Repair Lake Elsinore to have our experts consult you on the different options you have available.